The waiter tucked the team in nicely, took the order and vanished. "How do we get out?" said Lapinette. 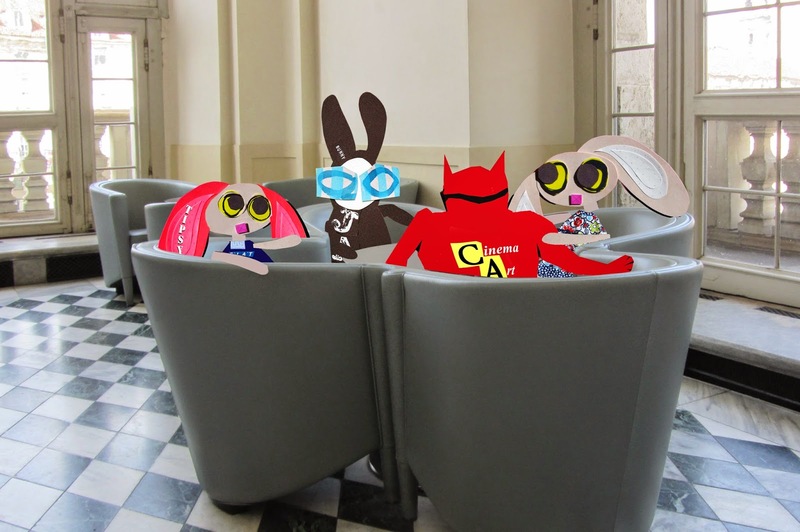 The Wabbit positioned himself to speak. "We don't usually have any trouble!" "Where's my dwink?" said Tipsy. "We just ordered," said Skratch, "it's only a matter of time." "Talking of Time," ventured Lapinette, "what was that for a kind of adventure?" It was the moment Skratch the Cat had been waiting for and he leaned forward with delight. "We were in a revisionist space western." Lapinette grinned. "Revisionism is a departure from tradition that favours critical views." Skratch nodded. "So each episode was a signifier only for itself." Tipsy suddenly waved. "The story showed that events shouldn't be stored in a shed, like gardening tools." "They can if you keep them in a neat block," said the Wabbit, who had been reading. Skratch was dismissive. "That assumes time and space is relative depending on where the viewer is located." "So what about the Zones?" asked Lapinette. "The Zones were self-actuating fields of persuasion, which bent towards us," said Skratch. They all went quiet. "What about iconic instability?" muttered the Wabbit. Skratch giggled. "The Zoner clocks were indeed unstable. They were icons and also signs." "What kind of signs?" asked the Wabbit. "Signs of the times," said Skratch.